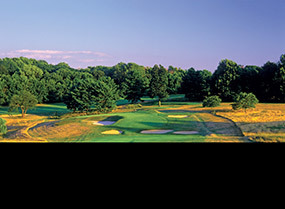 The prestigious Somerset Hills Country Club was founded in 1899, its early members golfing on a cramped nine-hole course beside the Ravine Lake in north-central New Jersey. 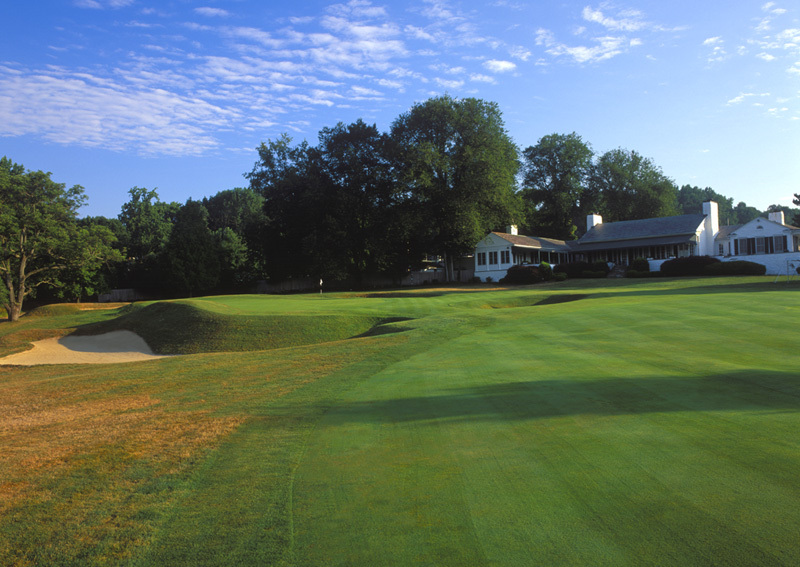 Lacking the space required for a full eighteen holes, the club soon looked to expand and in 1916 they purchased a vast estate in the nearby hills of Bernardsville. A.W. 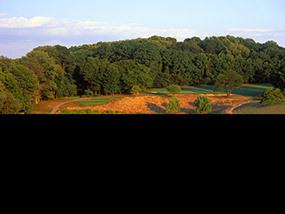 Tillinghast was hired to construct their new course, building his front nine across an open, spacious field and setting the back nine among a heavily wooded area that touched a natural dam and enjoyed great elevation variances. Somerset Hills was one of Tillinghast’s earliest designs, and also one of his most creative. The course tests almost every club in your bag and offers golfers endless variety with some rather unique hazard arrangements and a range of approach shot challenges. The use of droplet mounds, whether grassed over or part of a bunker complex, is particularly intriguing as are some of the experimental putting contours, which are often difficult to decipher. A number of targets, for example, are cleverly angled one way but look like they lean the other, while some that appear flat are actually quite steep. Less obviously dramatic than the back nine, the front is built across a softly moving meadow that once housed a racetrack. After a strong, bending par four opening hole, the 2nd is a fearsome Redan-style par three that features a narrow putting surface set atop an exposed knob, the target sloping steeply to its back left corner. The 3rd is then an innocuous looking mid-length hole with a wide-open fairway but a treacherous green site built on a steep hill and best approached from the more dangerous left-hand side. The lovely, sweeping approach into the crested 7th green is also very good, as is the long, one-shot 8th, played through chocolate-drop bunker mounds and into a green complete with small, random humps. Enjoying the pick of the golf terrain, the homeward nine starts with the only hole modified significantly from the Tillinghast design, its green pushed onto a plateau and the par extended from four to five. The hole is of only moderate interest but thankfully the rest is first-rate, starting with the fantastic par four 11th, which falls toward the lower basin area, turns around a hill and then rises into a brilliant green that tumbles sharply to the left. The next is a delicious par three with a peninsula green that extends into the dam, its putting surface leaning toward the water to ensure that golfers bailing toward dry land face a precarious recovery shot. Set atop a higher ledge, the next three holes are quality mid-length par fours with outstanding green sites. The target on the steadily rising 13th, for instance, is cut by a broad valley and features heart-breaking hole locations both within the valley and atop an upper tier. Aside from changes to the 10th, the Somerset Hills Country Club has diligently preserved this great track and they deserve credit for resisting the urge to modify holes or soften their marvellous green shapes. At various times they have had issues with tree growth and the loss of playing areas, but in recent years a carefully supervised restoration program undertaken by Brian Slawnik has successfully returned much of the layout to the original Tillinghast plan. What’s cool about this course are not necessarily the things that Tillinghast experimented with here and then took onto later projects, but rather the unique design features that he rarely tried anywhere else. 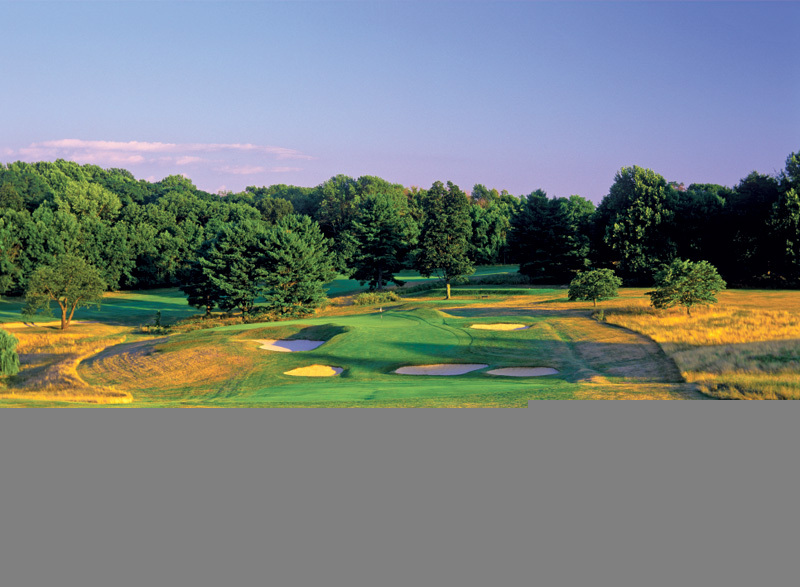 In every way Somerset Hills is a one of a kind, and a genuine standout in America's strong NorthEast golf region.